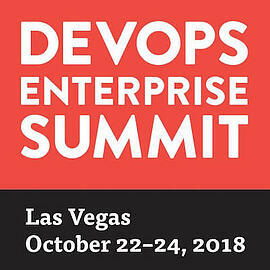 I was able to attend DOES 2018, the largest DevOps-focused conference in the world, in Las Vegas last month. There were many great presentations and I came away with a lot of new insights. In this post I’d like to share some of those key insights. My number one takeaway is that the main sticking point for DevOps adoption is not legacy technology, it's legacy thinking. Organizations need to be breaking away from the old mental models. Of course, this is hard to achieve because that legacy thinking—such as Waterfall or command and control—is the only thing anybody who's been in the workforce for a while has lived. Even if they believe in the new ways of doing things, when there's a period of pressure and stress, their muscle memory goes back to legacy thinking. This was really my biggest takeaway. Another valuable takeaway for me was about being able to define DevOps and articulate its benefits to non-IT parts of the organization. Compuware talked about how they were able to achieve a company-wide move to Agile and DevOps without having to ‘purge’ employees, which is something a lot of organizations think is necessary for a successful transformation. They achieved buy-in from the whole organization, and subsequent growth after a long period of decline. One key was an emphasis on balancing Development’s focus on speed and quality with ideation and customer obsession. Nike had their VP of Digital Platform Engineering present along with their Chief Privacy Officer and Global Counsel. They told the story of how the legal team was able to help the DevOps enablement process by talking about compliance. They talked about the concept of ‘minimum viable compliance,’ and how they were able to turn off two legacy systems with the help of the legal team. They were able to bake compliance into the whole process and even automate it, all because of the risk. The legal team was able to actually help IT quantify the risk of non-compliance and then use that to justify the effort of baking in compliance. Capital One had a Senior Director and Senior Distinguished Engineer present along with a member of their legal team on the benefits of collaboration towards the goal of using Open Source across the organization and even creating their own Open Source projects. Finally, CSG's Chief Architect and VP Software Development presented along with their VP of Product Management, and they talked about how they brought the Development and Operations teams together around the common goal of focussing on product value streams rather than on projects. My final takeaway—and this is a subset of legacy technology/thinking—was the importance of shifting from project to product (which CSG talked about in detail). The idea here is that projects create a short-term mind-set. With a project, you might put a team together, work on and deliver the project, then disband the team. For that project team, there's no skin in the game if the solution doesn't scale well or is not easy to operate. However, if you take a product mind-set, you have long-living teams, who do all the work related to the product and take a longer view because they have to maintain the product and operate it. Mik Kersten from Tasktop gave a particularly interesting talk on this topic. Were you at DOES this year? What were your key takeaways? To learn more about how Domain Consulting can help you with your Agile/DevOps transformation, get in touch with your account executive.